To learn more about the various types of ground loops and geo-exchange systems that can be employed, please refer to our White Paper. The vast majority of systems installed in Ontario (and in Canada) are either horizontal or vertical ground loop systems. 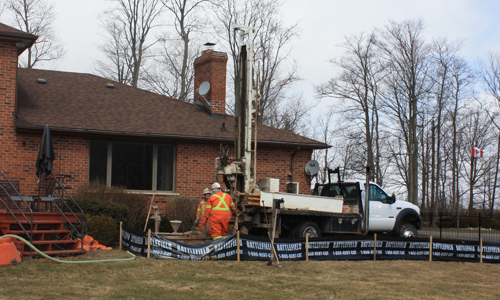 The CGC recently published the results of a national survey which reported that over 60% of all geothermal installations in Canada were horizontal loops. Vertical loops accounted for approximately 30%. At Quantum Geothermal, we have found our business to be split evenly between these two designs with hundreds of successful installations functioning across the west GTA. This discrepancy between our work and the national average is attributable to the fact that each year we take on a number of projects in Toronto and other urban centres where city lot sizes make vertical drilling the only viable option. 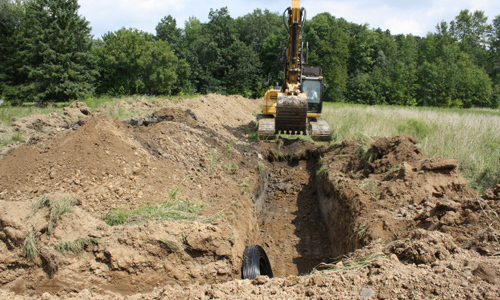 Most geothermal contractors do not operate extensively in urban areas.When we complete projects in rural areas most of the ground loops we install are horizontal configuration loops, more reflective of the national averages. When a property is of sufficient size, without too many trees and with a relatively flat contour, horizontal ground loops are the most cost effective design. Conversely, vertical loops offer the advantage of requiring only a very small area on the property, with the result that disruption to landscaping and restoration work is minimized. Properly designed, both styles of system will offer many years of reliable heating and cooling.